It is a Labor Day tradition for AAA to report the number of people traveling by car for the long weekend. AAA Travel projects 34.7 million Americans will journey 50 miles or more from home during the Labor Day holiday weekend. This makes it the highest volume for the holiday since 2008 and a 1.3 percent increase over 2013. Nearly 86 percent of travelers (29.7 million) will celebrate the holiday with a final road trip before summer comes to a close and children head back to school. Automobile travel will increase by 1.4% this year, with 29.7 million travelers hitting the road. Nearly 8% of travelers (2.65 million) will travel by air, up 1% from last year. Labor market improvements, cheaper gas prices and positive consumer expectations are driving the increase in holiday travelers. The thing is, as a travel industry, we think that it is a Memorial Day and Labor Day anomaly. Not so. The graphic to the right is from a paper that I wrote called Dare to Differentiate back in 2011. According to AAA's stats for this weekend, the statistics have not changed much. Yesterday American Airlines announced that they were pulling their inventory out of Orbitz. 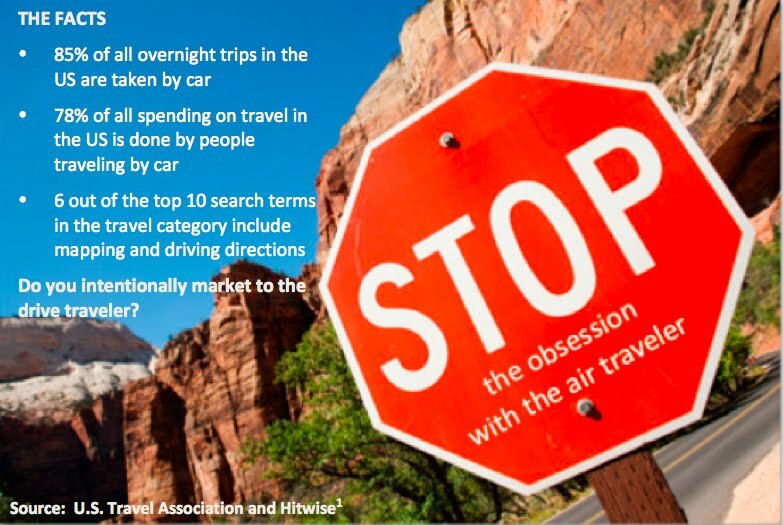 Stop the obsession with the air traveler. The best defense to the airlines wielding power with an OTA or any retailer is to focus on the other 85%. There is big money to be made from expanding your focus. Oh, and drive safely this weekend! Is INNOVATION DOA in your company?